What Personality Does My Dog Have? Five “Personality Types” of Dogs. What personality does my dog have? A person can be classified as an introvert or extrovert, but what about your dog? Are there any markers that can be measured to calculate a dog’s personality? Luckily there are brilliant researchers out there that have been able to solve this mystery. By knowing your dog’s personality type, you are able to better understand your dog and its behavioral quirks. In a similar way that you can’t treat a human introvert the same way as an extrovert, you can’t try to put your dog in a personality box it was not meant to be in. What Influences A Doggy Personality? It’s the age-old debate, nature vs. nurture. Is a personality, human or doggy, ingrained? Or can upbringing shape it? For a dog, the type of breed will firstly influence its behavior. For instance, some dog breeds are more inclined towards aggressive behavior than others, due to years of inbreeding to bring out this underlying trait. But that does not mean that you just have to make peace with the fact that your dog will always be aggressive, how you raise and train your dog can greatly influence its behavior. Your household environment will also affect how your dog’s personality evolves. Lastly your dog’s self-esteem will determine how your dog experiences the world. Similar to people, some dogs are bolder than others. You can try to challenge your dog to help it become more confident, but this will only work up to a certain point. What Personality Does My Dog Have? There are five different doggy personality types that have been classified. Your dog might not fall into just one specific category, but these descriptions offer you guidelines to better understand your dog’s behavior and to adjust your interaction with it accordingly. This dog is a natural born leader, taking charge of the pack. Still, this type of dog is also a team player, but just a bit more ready to take charge. In general the confident dog is quite dominant. With this in mind, steer clear of harsh discipline and training techniques. Underlying aggressive tendencies can be trigged, or your dog will simply become more stubborn to stand its ground. This type of dog feels very secure wherever it finds itself, whether at home or in the park. The self-assurance can be observed in the dog’ body language. Similar to the confident type, but much more standoffish. If your dog falls into this category, you will have to prove to it that you are the leader of the pack if you want to build a strong bond with it. By nature some breeds tend to be more independent. But they still have the capability to form a close bond with the most dominant family member, the one that takes control of situations in a patient and fair manner, proving to the dog that the person is a strong leader. This type of dog is fine to be on its own mission, away from the crowds. If this describes your dog, you will need to give it lots of space and don’t try to force the dog into a situation it doesn’t like. It’s sure to backfire, you will lose your dog’s respect and trust if you use forceful training techniques. This type of dog is the embodiment of happy-go-lucky. It is happy to meet any person or animal that crosses its path, even if the other part is not interested in making a new friend. The happy dog is very adaptable, content to share a space with other dogs or even cats. The flipside of all this happiness, is that it can be difficult to contain the dog’s enthusiasm. It’s crucial to teach your dog to obey basic commands such as sit, down and stay. Otherwise the dog will make a nuisance of itself with visitors to your house or when going for a walk. This type of dog is great with kids, but its level of excitement can scare them. This type of dog needs a bit of extra TLC. The dog needs an owner that can offer it consistent, patient and calm understanding. If this describes your dog, you need a sensitive approach to its feelings and needs. The timid dog needs to be kept away from unknown and uncomfortable situations, as well as loud and unexpected noises. Harsh training techniques, including yelling, will cause your shy dog to retreat into itself and not trust you. In worst case scenarios, the dog will become so fearful, it will react with an aggressive outburst. The best way to let this type of dog blossom, is to create situations that will boost its self-confidence, making the dog feel more secure in its surroundings. Daily exercise is a great way to do this, stimulating your dog’s mind. Reassurance that you love the dog regardless of its behavior will help it to feel more secure and safe. Read this article for some tips on how to deal with a fearful dog. Definitely the easiest of all the personality types. This type of dog loves pleasing its owner, making it very easy to train. It’s not quite as outgoing as the happy type, but it still gets on well with other people, dogs and cats. It’s easy to control this dog, it loves following a leader. This type of dog is affectionate, gentle and cooperative – making it the perfect family pet. Because the adaptable dog is so easy-going, it’s a great therapy dog, bringing happiness wherever it goes. You might have noticed there’s no such thing as a dominant personality. Dominance is not an individual personality trait. It is a term that describes the relationship between animals that have equal access to food, shelter and mates. In a wolf pack the alpha male will not necessarily be the most aggressive. 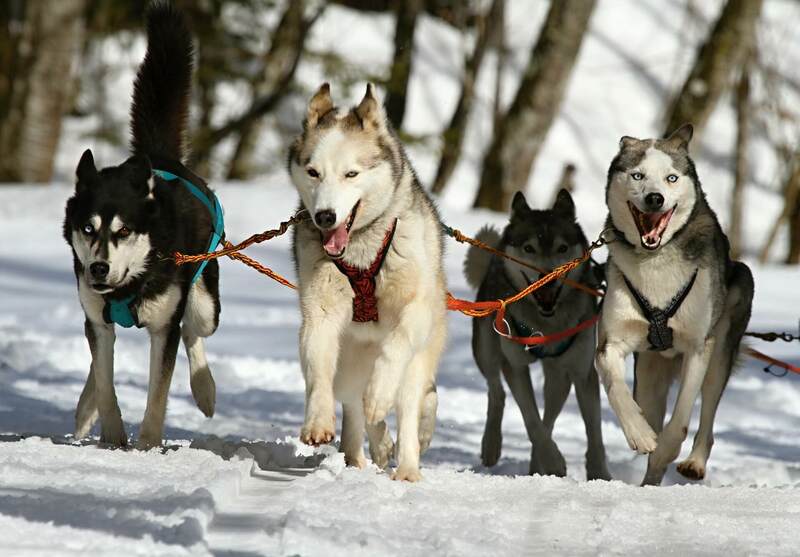 It will be the one that can lead the pack with a calm confidence and fairness. The main aim is to create a mutual working relationship between all the members of the pack, with benefits for the entire pack. Dogs are distant relatives of wolves and trying to enforce a pack hierarchy on your dog, will most likely cause it to distrust you. It’s a misconception that your dog will try to dominate you. Using outdated forceful training methods will only backfire, triggering the dog’s aggression. Positive reinforcement training will yield much better results. You are your dog’s master, but also its friend. By committing to try and understand your dog, you can avoid unwanted confrontations during training and socializing. Some dogs just don’t like being surrounded by other dogs, and that’s also fine. Discovering the “why” behind your dog’s behavior will help you to build a stronger bond with your beloved four-footed companion. What personality does my dog have? If you are really curious by now to classify your dog, there’s a handy quiz for you to find out! The alpha beta concept comes from a flawed study due to the enclosure and captivity of the wolves. Later studies reveal this to be the wrong way to think about the social dynamics amongst wolves. The idea that you have to be the pack leader when you live with a dog is a complete misconception. Fear creates a brat. Respect is friendship.